There are 800 acres that make up the Queensridge luxury community which is guard gated and provides custom built homes and estates for its upscale residents. Real estate in Queensridge offers luxurious English, French and Italian styled homes. The European flavor provides a one-of-a-kind dwelling along the western side of the Las Vegas Valley. Queensridge is located in the 89145 zip code. Winding, tree-lined roads lead to the elegantly designed community clubhouse that features a variety of resident amenities. Swimming pools, fitness center, spas, a conference center, green belts, parks, and landscaped gardens are found in the Queensridge community. The neighborhood is situated adjacent to the Badlands Golf Club, which features a challenging professional golf course that offers panoramic views of the Las Vegas Valley. Plenty of recreational opportunities are available within close proximity to Queensridge homes. From rock climbing, golfing, skating, picnicking, or just hanging out and relaxing, the area is equipped to entertain people of all ages and interests. Popular, yet not overly populated city parks such as Firefighters Memorial and the Charlie Kellogg and Joe Zaher Sports Complex provide fun for people ages 8-80. Amenities at the Kellogg Sports Complex include 11 lighted soccer fields, three dog runs, covered picnic areas, multi-purpose 2-½ mile track, and a concession stand. It is also home to the Amanda and Stacy Darling Memorial Tennis Center featuring nearly two-dozen courts with stadium seating. For those interested in mixed martial arts, the Robert Drysdale Jui-Jitsu Academy offers classes and programs for people of all ages and abilities. Ranging from kids, adults, and even professionals, the Drysdale Academy offers excellent, safe instruction in a professional, respectful environment at reasonable rates. Proximity to dining and shopping venues is one of the main benefits Queensridge offers its residents. Local dining options include upscale chains, hole-in-the-wall local joints and everything in between. Queensridge residents can often be seen enjoying their favorite meals at The Cheesecake Factory, Jamms Restaurant, Kona Grill, P.F. Chang’s China Bistro, TGI Friday’s, and The Bagel Café. Located at 750 S Rampart Boulevard, The Cheesecake Factory is known for its high quality ingredients infused into more than 200 menu items. Because of Cheesecake Factory’s diversity, Queensridge residents can enjoy a fun-filled family feast or a romantic date night. In addition to their world-famous cheesecakes, the menu is full of their signature “Glamburgers” including the out-of-this-world Macaroni Burger featuring creamy fried macaroni atop a charbroiled burger. For those watching their weight, the SkinnyLicious menu provides all the taste without the guilt. “Skinny” options include Chicken Samosas, Crispy Crab Bites, Chicken Pot Stickers, Salmon Rolls, and fresh baked flatbreads. 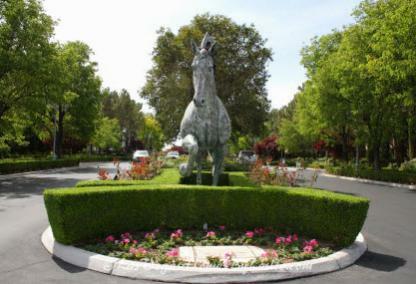 Living in the Queensridge neighborhood provides access to the nearby Tivoli Village, an area filled with dynamic retail and entertainment space. Restaurants, office space, and gourmet markets are also located within its border. Queensridge is a 20-minute drive to major casinos along the Strip and offers a variety of shopping venues directly onsite. Full service grocers and some of the best furniture stores in the state are located nearby. Mina Olive Custom Bridal, Mugsy & Moxie’s Bully Couture, Vasari, and more. In addition to the shops, there are 11 different dining options to choose from such as Brio Tuscan Grille, Cantina Laredo, Kabuki Japanese, La Casa Cigars & Lounge, and The View Wine Bar & Kitchen. Throughout the year Tivoli offers several family-friendly events including the fresh52 Farmers and Artisan Market, Live Music at Tivoli Village, Story time for Children, Santa’s Parade, and Monthly Pet Adoptions. Recent surveys show quality health care is becoming an increasingly important factor for prospective homebuyers. Queensridge offers a wide array of health care services ranging from pediatrics, surgery, preventative care, elder care, dermatology, and plastic surgery. Other services include free, over-the-phone nursing consultations, free symptom-checker App, online pre-registration for appointments, and real-time average wait times for the emergency room. Located within the Clark County School District, Queensridge offers a number of public and private schools within a 3-mile radius.